Because the Grand Canyon Trust is committed to the preservation of wilderness-quality lands and irreplaceable cultural resources on the Colorado Plateau, we cannot support the Emery County Public Land Management Act of 2018 (H.R. 5727/S. 2809) in its current form. The bill is being sponsored by Utah Senator Orrin Hatch, who pushed President Trump to gut Grand Staircase-Escalante and Bears Ears national monuments, and Representative John Curtis, who is also sponsoring legislation that would codify Trump’s unlawful 85 percent shrinkage of Bears Ears National Monument. 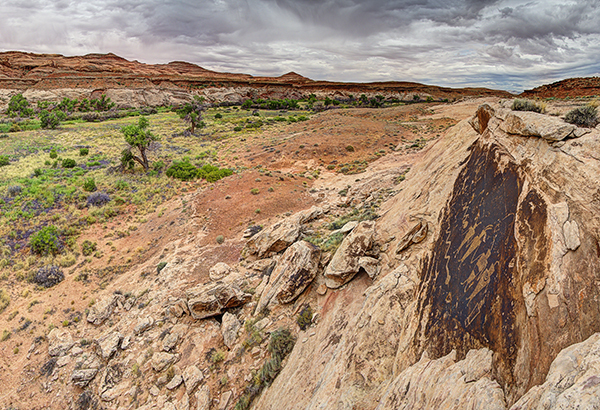 Contains language on state land exchange that fails to include safeguards to involve the public and Native American tribes in land-exchange negotiations, and could allow for the transfer of public lands to the state of Utah within the original boundaries of Grand Staircase-Escalante and Bears Ears national monuments. "Countless important rock art panels and other cultural sites are left available for oil and gas drilling, and that’s just unacceptable."